As we mentioned, the HP LaserJet 2420dn is a monochrome (black and white) laser printer with a maximum resolution of 1200x1200DPI. This is pretty much standard for mid to high-end laser printers, and should suffice for any text or graphic document you wish to print out. 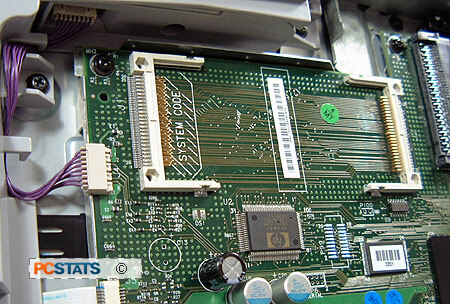 On the inside, the HP LaserJet 2420dn ships with 64MB of onboard memory, expandable to 320MB by means of a pair of 100-pin DDR-SDRAM slots, one of which is free. A 400MHz Agilent processor handles onboard printing and serving tasks. The printer can accept up to two Compact Flash cards internally for adding new fonts. 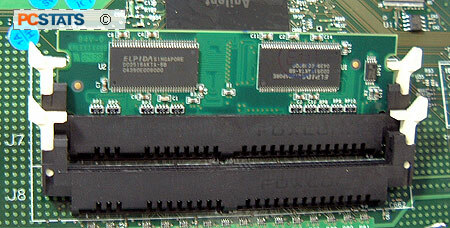 Round back, the HP 2420dn features a trio of physical interfaces; a conventional IEEE 1284 Parallel port and USB 2.0 jack handle direct computer connections. A 10/100 Ethernet port provides network access to the HP JetDirect embedded print server built into the printer for networked installations. An empty EIO (External I/O) port is also included which can be used to add further HP accessories and interfaces. The JetDirect print server has its own web-based interface which can be used to configure the printer from any web browser on the network. The server can send email alerts and even receive email commands. It has a variety of configureable alerts and status reports which it can deliver via email, simplifying administration. Telnet and SNMP can also be used to manage the printer. A variety of security options are available including passwords, encrypted sessions and MAC Access controls. A full set of statistics and printer status information is also available from this interface.